My dream for quite some time has been to travel to Paris and maybe even live there for a period of time. Most of my friends have been there and tell me it is calling my name. They say if I went to Paris I would probably never leave, and if that’s so let it be. I am currently reading a book about the secrets of the glamourous life of Coco Chanel and the world renowned fashion house she created in France nearly 100 years ago. Chanel had some deep and dark secrets that historians are just now exposing which makes the city where she lived even more intriguing. My journalistic instincts cause me to be nosey and my curiosity sometimes knows no boundaries. 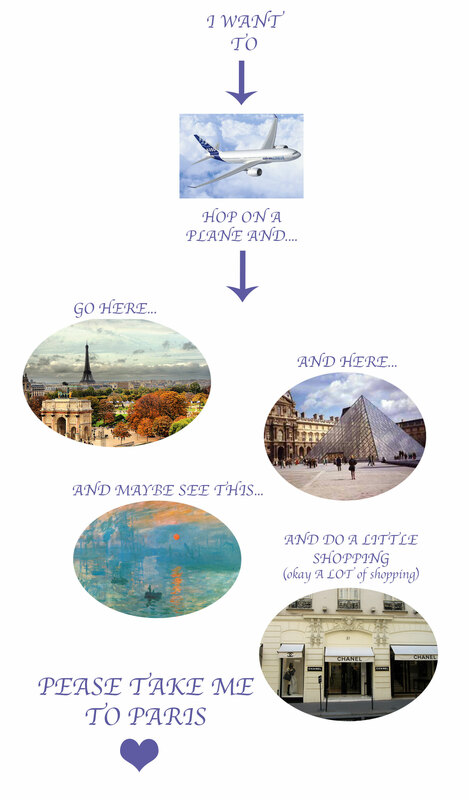 If I were to go to Paris I would immediately go to the Louvre (I would probably spend days there). As I have expressed in previous posts, I am a devout art worshiper and French Art is my absolute favorite! When I refer to French Art, I mean artists like Monet, Manet, and Degas (to name a few) who were all part of the Impressionist period of the late 1800s. I know it sounds incredibly nerdy, but I will probably cry on the day I get to go to the Louvre (whenever that day may be). Some other places/things I must do is go to the original house of Chanel and buy a handbag (duh), go to the eiffel tower at night, visit the gardens of Versailles, eat pastries and learn to speak some French. I don’t think this trip will be happening anytime in the near future, but one can dream right? i love this diagram! i want to go to paris too!